Rec-ConnectTM is a community-based program designed to inspire and empower people to engage regularly in physical activity (PA). The program is easy to implement with maximum flexibility to build both interest and capacity at the local level. The first step involves assessing existing community resources, including safety and security, that support physical activity. Next, community-wide physical activity demonstrations connect community members with local parks and other physical activity programs near them. And last, customized resources are provided to help participants continue physical activity at home. The goal is to shift how people think about physical activity and to create an atmosphere where families find it easy to be active together every day. Rec-Connect can assist with reaching this goal by providing physical activity demonstrations regularly, by engaging with community members to offer social support, and by reinforcing messages throughout the community via social marketing. Communities and families become more active and connected by exploring local physical activity resources such as local parks and trails. 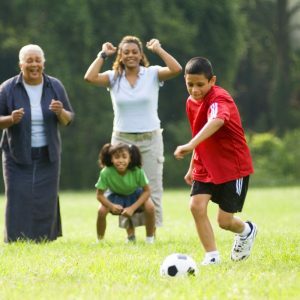 Individuals and families can meet up with others in their community while being physically active in a safe environment, producing role models and champions of healthy behaviors in the process. Programming materials and trainings build collaboration, creating a strong network that supports active living. Program and evaluation assistance can include data analysis and interpretation, developing community-specific strategies, and best-practices for community engagement and implementation. Assess both PA assets and gaps and then design promotion plan. Build a PA activity demonstration plan that includes both direct education and community connections. Implement PA demonstration and assess it. Complete the PA community assessment to identify sustainable community-level changes.